"In for a penny, in for a pound." is an old saying about getting involved. Anyway, getting involved with the dharma and our monastery (Karma Triyana Dharmachakra) in the mountains high above Woodstock, New York was for me not quite a hop, skip, and a jump. It took time and it took encouragement. And we were newbies. I love the dharma, but I also have some thoughts about joining a dharma organization. Here is my story. The most important dharma contact of all my wife and I already had, meeting the Ven. Khenpo Karthar Rinpoche, but aside from that we had about nothing in the way of dharma supports, not even a cushion, and probably even less knowledge. I am forever indebted to the monastery's fundraiser Mark Rothe for bringing us along. It was as simple as kind words, a phone call, and some help along the way. I can remember that Rothe sent me a little card with an image of the Buddha on it. I had none. I placed it on a shelf, sat down before it, and began to learn to meditate. This was many years ago. And while I loved the dharma that I was discovering, that love did not easily extend to religious establishments, even Buddhist ones. Organized religion, in my opinion, is a very mixed bag, one that I wanted little to do with. I had already been there and done that, with church on Sundays, Catholic school, being an altar boy, and all of that stuff. It was harsh! I happily had left all that behind years ago. On the other hand, as mentioned, we were becoming increasingly devoted to Khenpo Rinpoche because of his incredible kindness and qualities. My every contact with him was inspiring, and witnessing how he treated other people was extraordinary. He treated everyone the same, which was kindly and with actual attention. I could understand why he would treat me well. After all, to my mind, I was his devoted student, but it used to irritate me that Rinpoche would treat some rude college student (who was trying to poke fun at him) as well as he treated me. In my world we had hierarchies of affection. Rinpoche treated everyone the same, which was, to me, remarkable. As we started to travel more and more frequently to the monastery (kids and all! ), a trip of over 800 miles (one way), I began to mix a little more with the folks living there. I am not a joiner and, as mentioned, I don't exactly love authority in any form, even if it's Buddhist, so this took time. Yet I did slowly get to know the staff at KTD, eventually even serving on this or that advisory or project board. I also found that it was much better (for me) if I did or gave something to the monastery outright than it was getting involved in endless committees and meetings. Of course, I soon learned that Buddhist politics are no different from any other kind, mostly not my cup of tea. After all, this is Samsara, even if it is Buddhist Samsara. Year after year I would travel to KTD, promising my family and myself that I would not get too involved in this or that project, only to find myself up to my ears in politics and projects, and, surprisingly, often carrying the charge. Oh well, that I guess is just me. My point here is that, despite my distaste for organized anything, I found myself doing this, that, and the other thing around KTD. They were still just trying to get on their feet and needed all the help they could get. There was no monastery when I showed up, just a dilapidated old summer guest house on the mountain. Before I knew it, I was creating all kinds of graphics, layouts, brochures, and you-name-it. I secured their URL (Kagyu.org), helped them start a web site, worked on fundraising, and I (and my company staff) even created the little booklets they hand out for taking the refuge and bodhisattva vows. Margaret and I, along with the devoted Chinese Buddhist community, became the main fundraisers for their 3-year retreat buildings (Karmé Ling). So for someone who is not a joiner, I was joined. Meanwhile, on the home front we started our own dharma center locally, one of the many centers sponsored by the monastery all over the country and the world. We became the Heart Center KTC (Karma Thegsum Chöling), offering mediation instruction, group sitting, and all kinds of events. For a number of years we sponsored what was known as the "Family Dharma Weekend" at a couple of lake cottages we had. This was a weekend of dharma teachings for the whole family, with events and activities for the kids, great food, empowerments, and a rinpoche on hand. After all, we had kids. What are we supposed to do with them and the dharma? We also had a seminar on learning Tibetan, and another one that took weeks working with Ponlop Rinoche building a dharma curriculum for the sangha, and all kinds of other stuff. And there were frequent visits by many great lamas aside from our own Khenpo Karthar Rinpoche. These include H.H. Tai Situ Rinpoche, Thrangu Rinpoche, Khenpo Tsultrim Gyamtso Rinpoche, Lama Namse Rinpoche, Traleg Rinpoche, Bardor Rinpoche, Ken McLeod, Lama Karma, H.E. Shamar Rinoche, and many others. Over the years, even with all of the many other things I was involved in (like running a business! ), around our home it became something like 'all dharma, all of the time'. For me the dharma is the way things naturally are and I have never gotten over the fact that I could be a "religion" that I actually loved and that also was the truth! The Heart Center KTC was more than just the average KTC. We became a production house for all kinds of dharma support. For example, there is one huge project we undertook. For many years my wife and I funded and helped to run an arm of our monastery called "KTD Dharma Goods, a mail-order dharma-goods business that actually resided right here at our dharma center in Michigan. I set aside an area of my company just for this business, which was the monastery's business. And I staffed it. The monastery, which was still being built and getting started, was unable at that time to operate such a business on site for themselves, and hundreds of practitioners needed support materials, texts, sadhanas, etc. So we volunteered to do it. I once calculated that over the years we spent upward of a quarter of a million dollars on the project, with all revenues going back into the business. I have never wished to make a penny from the dharma, so I didn't. This is just my way of tithing. One of the things we did was to transcribe and publish English versions of a large number of Tibetan dharma teachings, mostly by my root guru Khenpo Karthar Rinpoche. 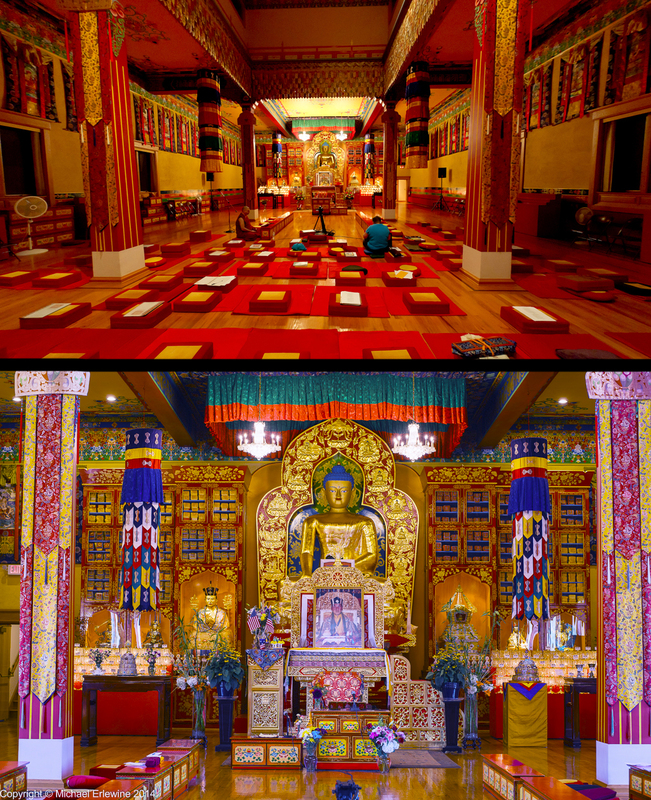 We had, until very recently, rooms full of thousands of cassette tapes that contained the original Tibetan and English translations of Tibetan teachings. They have been or are now being digitized by my good friend Lama Tsultrim, who is the men's retreat master at Karmé Ling, our three-year retreat center in Delhi, NY. I have transcribed and edited scores of these teachings myself, some the size of entire books, and my staff did the same. For a number of years one of our staff members was Sange Wangchug, originally a Bhutanese monk and scholar who spoke something like seven languages, including Sanskrit and Pali, and of course Tibetan. He was also a brilliant calligrapher and artist. With Wangchug's help we designed and built our own stupa right here on our property. Today Wangchug is a member of the Privy Counsel of Bhutan, serving as the Minister of Culture or some such title. My very dear friend David McCarthy, who both reads and writes Tibetan, ran our operation for something like five years himself. David is a very dedicated practitioner, videographer, and generally a brilliant person. And there were others there too, like Robert Walker, who today manages the writings and books of Pema Chödrön, Clarke Fountain (an editor), and Bob Martinez from the Chicago center of our monastery. We not only published many dharma teachings in English, but also produced a whole series of Tibetan sadhanas (practice texts) for some of the main practices done in our lineage, complete with embossed foil covers and fine linen paper. Many were illustrated by Sange Wangchug, who also wrote out the texts by hand in calligraphy. In addition, we had a full line of cushions, statues, and other practice items that we imported from Nepal and India. We provided dharma support to our sangha for many years. So there you have a brief history of my involvement with the organized end of Buddhishm, at first perhaps with caution, but later with abandon.